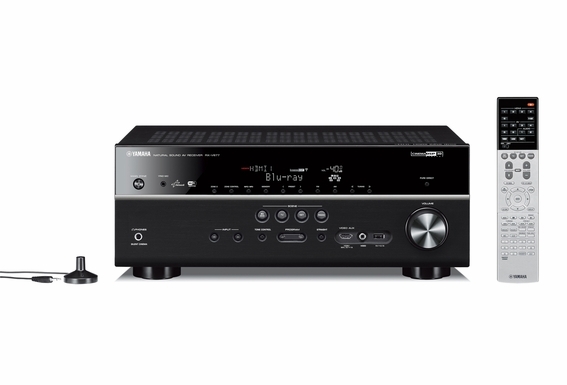 Yamaha AV receivers are the perfect control centers for a home entertainment network. Their network functions include support for FLAC 96/24 (high quality lossless format), compatibility with Windows7 and DLNA 1.5 (for finding and playing digital sources) and web browser control from a PC or PDA. AirPlay provides the convenience of wireless music playback of your iTunes from iPod/iPhone/iPad and Mac/PC. DLNA certification ensures a device has been tested and proven compatible with various CE, PC and mobile devices designed according to the DLNA Interoperability Guidelines. Products certified by DLNA will bear a logo that will give consumers peace of mind that the device they are purchasing has undergone rigorous testing and conforms to the Interoperability Guidelines. Meet your new music collection complete with millions of songs, entire albums and artist hits spanning the decades. This is more than just internet radio. This is the power to play exactly the songs you want, wherever you are. Give it a try, sign in and start listening. Dolbyï¿½ TrueHD is Dolbyï¿½s next-generation lossless technology developed for high-definition disc-based media. Dolby TrueHD delivers tantalizing sound that is bit-for-bit identical to the studio master, unlocking the true high-definition entertainment experience on next-generation discs. When coupled with high-definition video, Dolby TrueHD offers an unprecedented home theater experience that lets you enjoy sound as stunning as the high-definition picture. DTS-HD Master Audio delivers sound quality that matches the clear and vivid images of high-definition video. Blu-ray and HD-DVD discs deliver five times the video resolution of standard DVD and produce images with stunning realism. But that's only half of the story. You need incredible sound to complete the high definition experience and DTS-HD Master Audio provides the highest quality multi-channel sound possible. Movies come alive with sound as lifelike as the picture and music becomes as real as a live performance. MHL (Mobile High-definition Link) is the interface standard for high-speed digital video signal transmission that is developed for mobile devices. This interface transmits both digital audio and digital video signals from mobile devices (such as smartphones) using a single cable with any loss. As with HDMI, MHL complies with HDCP (High-bandwidth Digital Content Protection). HDMI (High-Definition Multimedia Interface) is the first and only industry-supported, uncompressed, all-digital audio/video interface. With the ability to deliver crystal-clear, all-digital audio and video via a single cable, HDMI dramatically simplifies cabling and helps provide consumers with the highest-quality home theater experience. HDMI can provide an interface between most audio/video sources, such as a set-top box, Blu-ray Disc player, DVD player or AV receiver and a video monitor, such as a High-Definition Television (HDTV), over a single cable. Depending on the model of product, HDMI can support standard, enhanced or high-definition video, plus multi-channel digital audio on a single cable. It can support all currently-available compressed audio formats (such as Dolby Digital and DTS) and most newer HDMI devices can support lossless digital audio formats like Dolbyï¿½ TrueHD and DTS-HD Master Audioï¿½. ï¿½Made for iPod, iPhone and iPadï¿½ means that an electronic accessory has been designed to connect specifically to iPod, iPhone, iPad, and has been certified by the developer to meet Apple performance standards. 4K pass-through receives super high-def resolution video and passes it to a 4K compatible monitor. This ensures compatibility with the latest super high resolution video formats. 4K upscaling boosts a lower resolution image to super high-def resolution video. This ensures compatibility with the latest super high resolution video formats. The actually measured sound field data contains the information of the height of the sound images. CINEMA DSP 3D mode achieves reproduction of the accurate height of the sound images so that it creates the accurate and intensive stereoscopic sound fields in a listening room. SILENT CINEMA makes it possible to hear large-scale surround sound through ordinary headphones! This is a variation of CINEMA DSP technology that Yamaha developed to let you listen in private to movies and other multi-channel sources for hours without listening fatigue. Four SCENE buttons make operating the receiver easier than ever. They are initially set to default settings for DVD viewing, disc listening, TV viewing and radio listening. Pressing a SCENE button automatically launches a number of operations that initiate play of the source controlled by that button. Other SCENE settings are also available, such as iPod listening, XM listening, TV sports viewing and action game playing. Browsing and selecting the settings is quickly accomplished by changing Input via the front panel and watching the on-screen display. The settings can be selected for one-time use or they can replace the original default settings. The SCENE names can be changed, too. Yamahaï¿½s YPAO system uses a small microphone and sophisticated equalization to automatically set the best sound for any room, no matter where the speakers are. First it checks the speaker connections and phase of each speaker. Then it sends out tones which are captured by the microphone to analyze the room acoustics and sets a variety of parameters, such as the speaker size, the distance of the speakers and even the sound pressure level, etc. Until it achieves the best sound conditions for your room and you don't have to do anything! 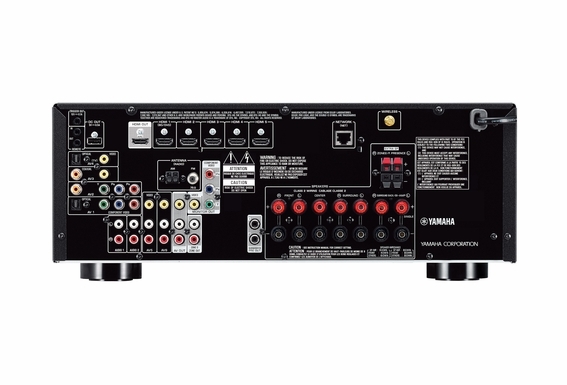 Yamaha receivers displaying this icon support 3D HDMI pass-through from 3D-compatible Blu-ray Disc, game and broadcast devices to 3D-compatible HDTVs. 3D provides a more engaging audio and video consumer experience when using 3D-capable products and 3D media content. Note that special eyewear may be required for viewing 3D content.